Every year millions of animals including whales, dolphins, turtles and birds are mutilated and killed by lost, abandoned or discarded fishing nets, otherwise known as “ghost nets.” Entangled animals either drown within minutes or endure long, slow deaths lasting months or even years, suffering from debilitating wounds, infection and starvation. Oceanic currents provide pathways for ghost nets to travel huge distances from their points of origin, often accumulating in various hotspots around the world. 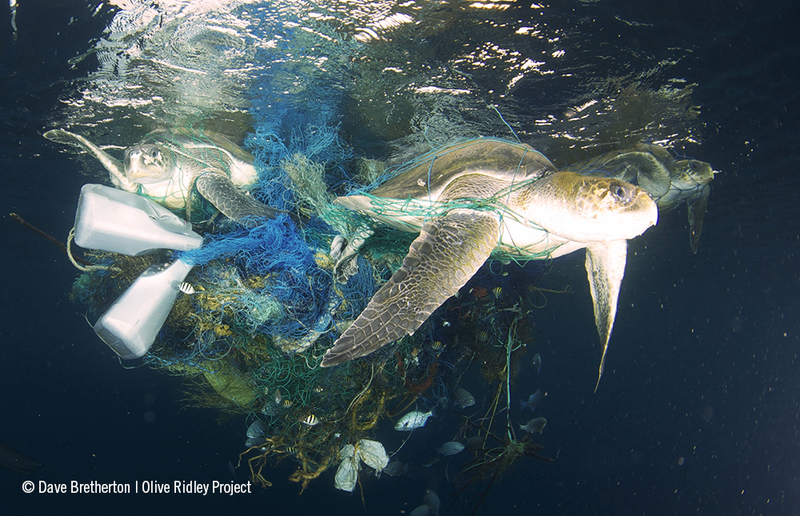 The Olive Ridley Project (ORP) was founded in the Maldives by biologist Martin Stelfox in response to the alarming number of olive ridley sea turtles found entangled in ghost gear. ORP collects data from citizen scientists and marine biologists working predominantly in the Maldives but also in other Indian Ocean countries. Citizen scientists are usually boat captains, dive masters, and vacationers. We also have a large network of marine biologists based in various resorts throughout the Maldives that are contributing by actively recording and removing ghost nets. In collaboration with the International Union for Conservation of Nature (IUCN), ORP has developed a standardized protocol that anybody can use to record data on the designs of recovered nets and details of entangled animals. Since July 2013, over 100 olive ridley entanglements and over 300 ghost nets have been recorded by ORP. We use this information to try to identify where ghost nets originate so that the scale of the problem can be quantified and necessary steps taken to help mitigate it. Education makes up an important part of our work. By visiting local schools, conducting workshops, meeting local fishing communities and organizing seminars we are able to spread awareness on the issue of ghost nets within the Indian Ocean. We work towards encouraging a sense of care and responsibility among the people who are able to make a difference, changing behaviors by actively removing ghost nets from the environment and discouraging the public from throwing unwanted nets into the sea. A large proportion of animals found entangled in the Maldives are marine sea turtles, specifically the olive ridley. To help relieve the suffering of these animals, ORP has recently designed a turtle rescue center that is scheduled to be constructed in the middle of 2015. This center will help care for the many injured olive ridleys found in the Maldives before they are released back into the wild. In addition, ORP is part of the Global Ghost Gear Initiative founded by the World Animal Protection International. This initiative brings together a powerful alliance of governments, industry, IGOs and NGOs that will work together to tackle the problem of ghost fishing gear on a global scale. Eventually, the data that is collected and sent to ORP will contribute towards a global data hub that may be used to quantify the problem globally. This could be a great tool to further understand how ghost gear moves and potential mitigation measures that could be taken.